Eliminate 99.9% of the harmful germs and bacteria that sometimes come from spills caused by breast feeding. The Medela Quick Clean Micro-Steam Bags (5 Pack) work faster than boiling breast pumps in water and are much more effective than a dishwasher. Just add water and put the micro steam bag in the microwave. Provides an economical way to get rid of the contaminants that can cause infections. 5 reusable bags per box (approx. 100 uses). 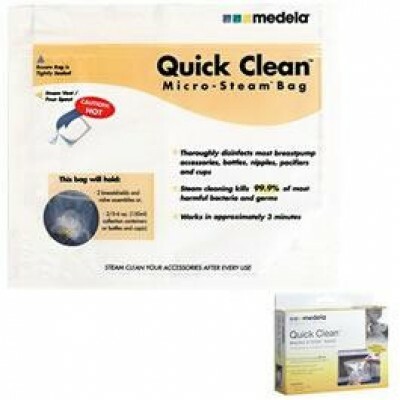 Get rid of 99.9% of the contaminants from breast pumps and accessories with the Medela Quick Clean Micro-Steam Bags (5 Pack). Simply add water and heat up the micro steam bag in the microwave. These are much faster and work better than either boiling water and more effective than dishwashing. Helps to prevent baby's illnesses by eliminating germs and bacteria. Each order includes 5 reusable bags that can be used about 20 times.